Day 46: Right of Way, originally uploaded by Here Be Dragons. Taken this morning, in my backyard. I think this shot probably needs to be LOL'd, but I can't quite think of the right caption. 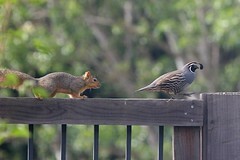 The squirrel looks rather carnivorous, ready to pounce on the hapless quail. 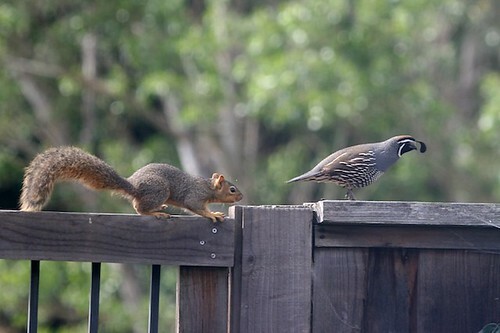 In reality, there was no pouncing; the squirrel* was just passing through, and the quail got in the way. A couple of seconds after this photo was taken, the quail flew down into my yard, giving the squirrel the right of way across my back fence. Oh! And how funny . 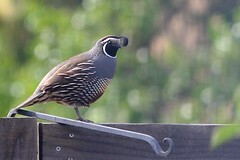 . . as I'm writing this, I've just looked out the window to see that there's a quail (the same one maybe?) up on my back fence again. I think the male sits up there to act as a sentry while the female and their chicks are foraging on the grass behind my yard. *A "squirrel" squirrel, btw; not one of the ground squirrels whose photo I posted a few days ago. These guys don't usually come back here, so it was especially interesting to me to have one run through the yard. Please explain the difference between a ground squirrel and a "squirrel" squirrel. (And the "squirrel" squirrel thing came about in the comments of one of my recent entries, which also has a photo of one of the ground squirrels that hangs out in my yard: http://here-be-dragons.livejournal.com/554990.html ). The fox squirrel is way cuter. And it IS native to North America, if not California. So ... how did they get here? Did they hitchhike? It's not like they had to cross an ocean. Maybe they just kind of migrated here because they like the beach. I don't think they're nearly as pesty as, say, eucalyptus trees. Eucalyptus trees are pesty in many ways. They don't make good firewood, they don't make good furniture (too splintery), the splintery quality also makes them dangerous because branches just snap off and fall, they're messy because the bark peels off, and they grow like weeds thereby choking out native growth. They're only good for feeding koala bears. They should have stayed in Australia. Oh, I know they're pesty. I like them anyway. Just like the fox squirrels are pesty (they complete with the native gray squirrels, who seem to be losing the battle). But it's okay if you like them anyway, too. What cracks me up when I look at the first photo is the squirrel's front claws. For some reason, the way s/he is standing make it look like there are MEGA CLAWS OF DOOM on that front foot! Seriously, s/he could take out the quail with one swipe. I don't think squirrels really have gigantor claws (and the feet look normal in the other shot) . . . but maybe this is a mutant. Like the squirrel version of X-Men. I have WOLVERINE SQUIRREL in my backyard! OH YEAH!!!!! !